Heavy Lifting - Venture Assessment Tools Applied to Early-Stage DOD (USAF) Technology Investments Across a Complex, Distributed Enterprise. The United States Air Force is arguably the world�s largest single technology investor, investing $3.2 billion each year in over 2000 projects. The USAF is faced with the daunting task of managing a huge portfolio of technology investments. It recently conducted a study to explore the feasibility of establishing a more traditional venture investment fund model, similar to the CIA�s In-Q-Tel. Part 1 of this workshop will present the findings of a recent study explored various DOD venture investment business models and how early-stage technology development is done. It will also place into context the magnitude of the challenge when managing a portfolio of high value, early stage projects in a distributed enterprise environment. Corporate investors may wish to consider partnering with the USAF in order to access it�s portfolio of cutting edge technology and investment capital. VenLogic will present its venture assessment tools and equity marketing framework that can be used to facilitate portfolio management communications in complex environments. The DOD faces challenges similar to corporate venture investors who manage a number of technology investments, with team members in a distributed enterprise. VenLogic led a recent DOD case study of a high value early-stage technology project with an integrated product team distributed in multiple states. The DOD portfolio manager�s challenge is to quickly and accurately assess the situation, report the status, and recommend solutions in an environment with multiple cultures, various degrees of business acumen, and unrelated management structures. 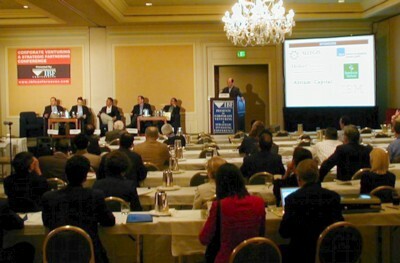 VenLogic will introduce a framework that allows a) consistent tracking of best practices, b) a means to rapidly and consistently communicate (as mandated by regulatory requirements) critical project status across a portfolio, c) establish a common investor language that connects between DOD and strategic industry partners in the commercial world, d) therefore, allowing management a means to optimize allocation of limited resources, and e) gain the added benefit of accelerated executive MBA training among technical teams. VenLogic will demonstrate this framework on a live case. An early-stage company based in Seattle, Russia Jet Direct, is a charter airline business seeking $5M in capital to serve the needs of the energy industry between the US and Russia. The CEO of this company will briefly present their business case. VenLogic will introduce venture assessment exercises and tools, also used in the DOD case study above, to allowing participants the benefit of assessing this case for themselves. The workshop participants will be asked to use whiteboards in teams and perform exercises guided by the facilitator. This workshop will close with a goal of getting the entire room to a common viewpoint of the case, enabling everyone to leave the program with a common language for communicating deal issues in a distributed enterprise environment. Cross-functional input from venture investor peer group discussion. Receive DOD VC Industry Report "Evaluate Initiation of an Air Force Venture Capital Fund", by Bernard M. Chachula. Published by Wright Brothers Institute. May, 2004. 88 pages. This newsletter is by VenLogic LLC, Copyright 2005.